See the rabbit below. Imagine she is a female client. Imagine the carrots are men. 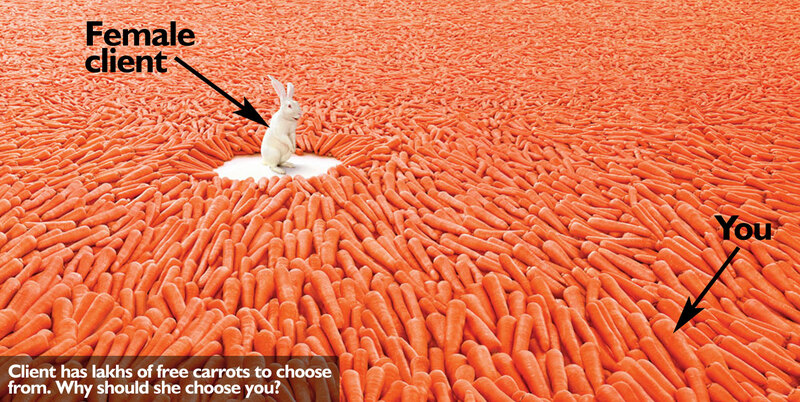 One of those carrots is you. Do you think she has a problem finding a man? Lakhs of men are waiting desperately to be picked by her. Why would she pick you? What's different about you. More important, why would she pay you? Think about that. Subscribe to my free Gigolo Training tips, and you may eventually understand. And btw, even if you're not interested in being a gigolo, following these tips will make you the kind of man that every woman wants to meet. Some women require a companion because she is lonely. The gigolo provides companionship and sharing of thoughts, ideas and hugs. If both of them are adult (over 18 years of age) they are free to consensually get intimate too, this is a free country. Gigolos are sometimes hired by women to accompany them to social events that most people attend as couples, and where she would otherwise feel awkward attending alone. Partner dances are dances whose choreography involves coordinated dancing of two partners following a sequence of steps. A gigolo can sometimes serve as a dancing partner. Gigolos are also hired by single women when they visit a government office or any place where she would prefer being accompanied by a man whose presence offers her courage and support. Gigolos are hired by single women who need a sports partner at their club. Example: If they wish to play Tennis or Badminton, having a regular partner helps them be regular in their sports activity. © GigoloTraining.com. All rights reserved.